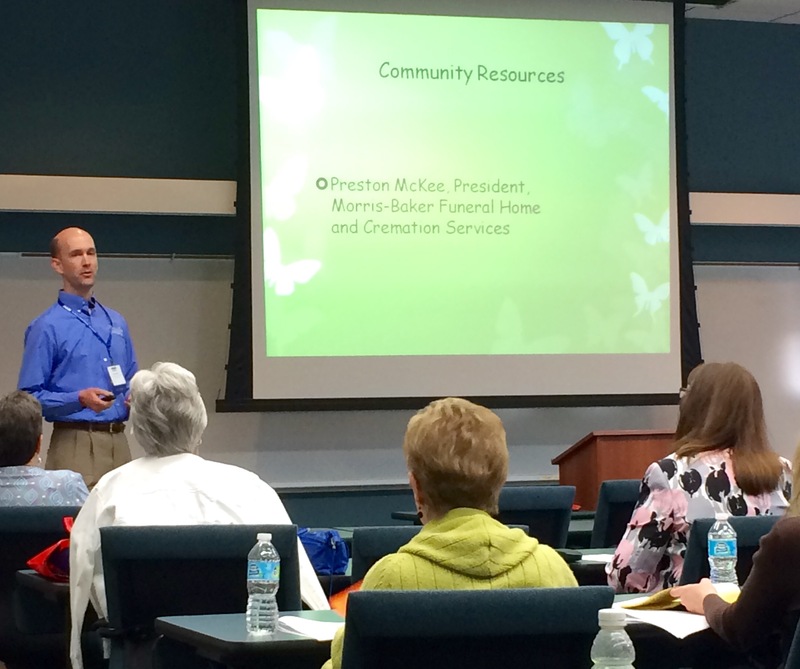 Preston McKee shared information on community resources related to grief during the First Tennessee Area on Aging and Disability’s Annual Conference on May 2, 2017. The session, Living with Loss: a Basic Guide for Graceful Giving, was led by Christine Adler, PhD, Psychologist for the Oncology and Hospice and Palliative Care of the Veterans Affairs Medical Center. Participants explored the range of ‘normal’ grief expression, learned the differences between grief and depression, and reviewed common misconceptions about grief, as well as current theories regarding healthy and more complicated responses to loss. Preston then talked about resources in the community that can assist people in their loss journey. Kibbi, the Morris-Baker therapy dog, also made an appearance. The conference, themed “Age out Loud,” was held Tuesday, May 2, at the Millenium Centre.